About 51,000 illegal firearms, a fifth of all illegal guns in Australia, have been surrendered in a three-month amnesty, reflecting the country's tough gun controls. LAS VEGAS • The US gun lobby, which has seldom embraced new firearms-control measures, expressed a willingness to support a restriction on the rifle accessory that enabled a Las Vegas gunman to strafe a crowd with bursts of sustained gunfire as if from an automatic weapon. 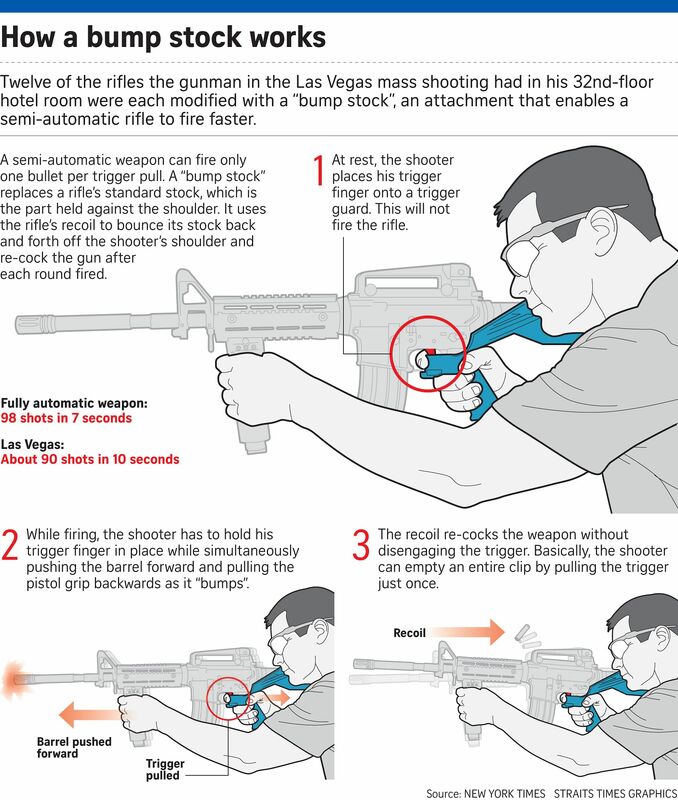 Gunman Stephen Paddock, police said, fitted 12 of his weapons with so-called bump-stock devices that allow semi-automatic rifles to operate as if they were fully automatic machine guns, which are outlawed in the United States. The authorities said his ability to fire hundreds of rounds a minute for 10 minutes from a 32nd-floor hotel suite was a major factor in the high casualty count of 58 people killed and hundreds wounded. Paddock, 64, killed himself before police stormed his suite. The carnage on Sunday night across the street from the Mandalay Bay Resort and Casino ranks as the bloodiest mass shooting in modern US history, surpassing the 49 people shot dead last year at a gay nightclub in Orlando, Florida. The influential National Rifle Association (NRA), which staunchly opposed moves to tighten gun control laws after the Orlando massacre and others, said on Thursday that bump stocks, which remain legal, "should be subject to additional regulations". "Gun control is a failed policy. We have tried it and it is safe to say it doesn't keep people safe," Mr Chris Cox, executive director of the NRA's Institute for Legislative Action, said on Fox News on Thursday. "There needs to be an honest conversation about solutions that work, and one of those solutions is to make sure the Second Amendment is supported and protected." Democrats were urging new legislation, as the shooting reignited the longstanding US debate over regulation of gun ownership, protected under the Second Amendment of the US Constitution. The NRA called for the US Bureau of Alcohol, Tobacco, Firearms and Explosives to address the issue of bump stocks by regulation, rather than opening it up to the legislative process. Senior Republicans also signalled that they were ready to deal with the sale of bump stocks - an accessory which gun control advocates regard as workarounds to bans on machine guns. "Clearly that is something we need to look into," House Speaker Paul Ryan told radio talk show host Hugh Hewitt. US Representative Steve Scalise, a member of the Republican House leadership who is himself a victim of gun violence, voiced concern that hasty congressional action to curb bump stocks could lead to wider limits on "the rights of gun owners". "There are people who want to rush to judgment," he said in an MSNBC interview on Thursday. US President Donald Trump, an outspoken proponent of gun rights during his campaign for the White House, suggested he was open to curbs on bump stocks. Thousands of mourners turned out on Thursday for a candlelit vigil honouring Mr Charleston Hartfield, a 34-year-old Las Vegas police officer and member of the Nevada National Guard who was among those killed at Sunday's concert while he was there off duty. Under a full moon in a grassy memorial park, a police honour guard including bagpipes paid tribute to Mr Hartfield, who leaves behind his wife and two children. The Las Vegas Review-Journal reported on Thursday that organisers of a gun show scheduled for this weekend at the Eastside Cannery Casino had cancelled the event, saying it did not seem prudent in the light of Sunday's tragedy.